Let's have a toast for my mentors, let's have a toast for my family, let's have a toast for SA Pros, every one of them that I know. Last weekend I was blessed with some free time and was able to finally work on a craft that has been on my mind for ages. 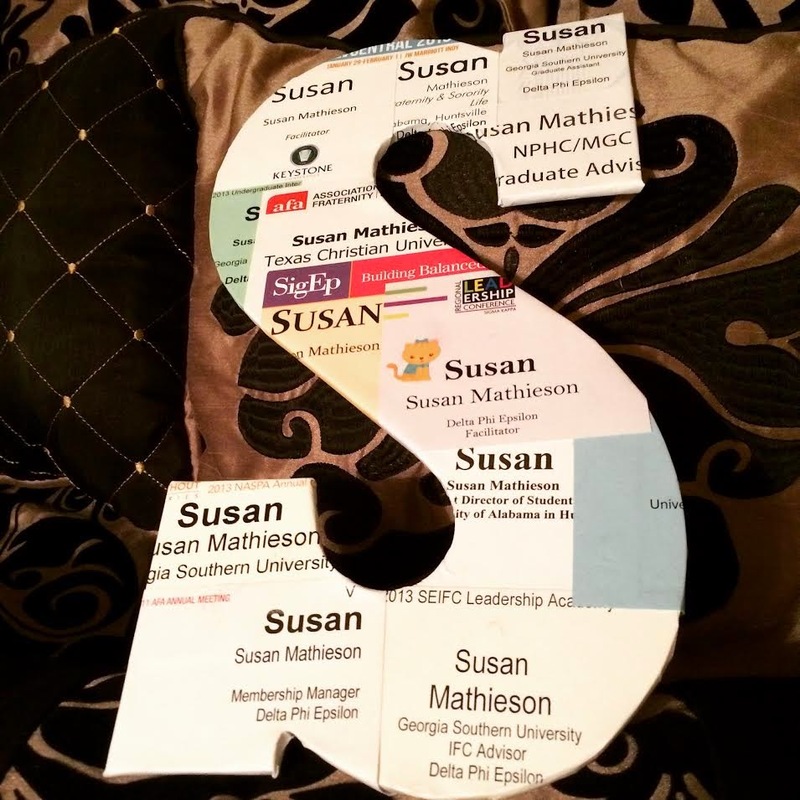 Over the last four year in Student Affairs, I have had the opportunity to attend numerous conferences and leadership institutes – each one I was supplied with a name tag. A few months ago, I began feeling like a bit of a hoarder and decided I either needed to do something with my name tags or I needed to toss them. During one of my Pinterest raids, I found a post where runners decoupage their bibs to wooden letters. I knew immediately this was my next project. As I was gathering up all of my name tags in preparation, I found myself reminiscing on each of the experiences in front of me. I was engulfed in gratitude for all of the people in my life that had supported me and believed in me enough to have had all of these opportunities. At a presentation a few years ago I was told that leadership is telling the people that made an impact on your life that they have done so and I feel like this is as good as a time as ever! Thank you to everyone at Delta Phi Epsilon who believed in me and started me on this incredible professional journey. Thank you Kendra for believing in me as a recent graduate, when I am not sure I believed in myself. Thank you to Emily for supporting me as I made mistakes and started to find out who I was as a new professional. Thank you to my True Blue family I gained during my two years in Statesboro. Rob and Andrea – I can’t thank you enough for the weekly reminders to send my resume to Joy and pushing me until I signed up for the GRE. At that point, I had no idea I was going to gain two of the best friends I could have asked for. Jess – thank you for the two years of amazing. Thank you for understanding what I actually meant when I was “freaking out” and for encouraging me to get as involved as possible. My time at (the real) GSU is irreplaceable. Thank you to my family – I wouldn’t be here without your tremendous support. I wanted to move 14 hours away for a graduate school experience in the south and you all encouraged me to do so. Then when I wanted to spend a summer in Texas, which meant missing Katie’s graduation – you told me I had to because of how incredible an opportunity I had offered. I know I have missed a lot over the last three years, but you all are always my number one cheerleaders, so thank you! Thank you to the amazing horned frog friends I made during my summer at TCU. Everything happens for a reason and there was no better place for me to spend summer of 2013 than in Ft. Worth with you all. Thank you Brooke for taking a chance on me, thank you Molly and Kaitlin for Bachelorette girls nights, thank you G and Kent for teaching me spades and thank you team grad (and Natalie!) for making TCU my home. Thank you to all of the inter/national fraternities and sororities and professional associations that have provided me with opportunities to volunteer and give back to this community. Because of you, I have had so many opportunities to make a difference and growing as a professional while doing so. Thank you to my Charger family! You all have welcomed me with open arms over the last year and supported me more than I can describe. Thank you for constantly providing me with opportunities for growth. Nikki and Kacey – thank you for the making Huntsville a home, I am so lucky to have you both on my side! Lastly – thank you to all of the students I have gotten to connect with over the years. Thank you for allowing me to serve you in different capacities and for helping me grow. Each interaction I have had with you has taught me something new and has helped me become a better professional and individual. Cheers to you all! I wouldn’t be where I am today without all of the love and support from you!